Food waste has become a hot topic around the world. From the United Nations committing to reduce food waste by 50% by 2030, to Italian legislation that encourages supermarkets and farmers to donate food to charity, and diners to use doggy bags to take their leftovers home. Even Australian Environment Ministers at their next meeting in 2016 will be discussing options for reducing food waste. One of the first steps in food waste reduction, however, is to have a comprehensive measure of food waste quantities in addition to simply recognising it exists. The World Resources Institute recently published the first set of standards to help nations to do just this. In Australia, the Commercial & Industrial sector generates approximately 1.9 million tonnes of food waste annually, of which 78% ends up in landfill. The Australian food and beverages services and the food retail trade sub-sectors contribute nearly half of this. As opposed to composting, when food waste goes to landfill it creates a significant amount of methane – a greenhouse gas 21 times more powerful than CO2. Then there are all of the natural resources wasted due to food grown but not eaten: top soil, fertiliser, water, energy, etc. However, the figures mentioned for food waste in the foodservice sector are estimates of estimates. And the best way to get an exact figure is to measure it directly. 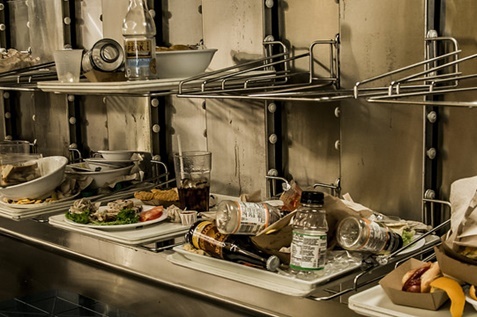 Unfortunately, most foodservice businesses do not think they produce food waste. But that is possibly because they do not measure it. Interim results from the RMIT University research project Watch My Waste uncovered that only 22% of foodservice businesses had ever done a food waste audit or assessment. Tracking foodservice food waste is exactly what McGrath and the team are doing at RMIT University – a national-wide hospitality sector food waste research project that is still seeking more foodservice business to participate. “When I spoke with some businesses, they were telling me that they were really efficient with their food, yet customer’s plates were coming back to the kitchen with a quarter of the food still remaining”, said McGrath. UK food waste research suggested that food waste in the hospitality sector is occurring predominantly in the kitchen, but varied depending on the type of establishment. The early interim data from Watch My Waste is suggesting a slightly different picture in Australia, with more food waste occurring front of house – something in the vicinity of 120g per cover or more. McGrath and the RMIT team are interested in understanding why this is happening in Australia. They launched a consumer survey, What’s On Your Plate?, to try to uncover the diner’s experience with food waste when they eat out. Diners have also recommended that businesses offer more variable portion sizes, and compost the leftovers that they do not take home. 1. Plan and trial new menus with customers to see if they are effective. 2. Buy perishable food in smaller quantities more frequently otherwise it may spoil. 3. Look at ordering history – of customer orders and stock needs. Is there a mismatch? Buy only what you need. There are good software systems around to help. 4. Purchasing more pre-prepared food pushes some preparation food waste further up the food supply chain where it can be managed in greater volumes. 5. If you have a buffet, provide smaller serving plates for customers, but encourage them to come back for more if they are still hungry. They will take and waste significantly less food. 6. Around 40% of the food thrown away is high carbohydrate foods such as potato, bread, pasta and rice. Cook and serve more suitable portions of these foods, or offer them as optional sides. 7. Train staff on correct food storage, portion sizes, and food preparation techniques. This reduces food waste in all parts of the business. 8. Offer doggie bags. Research shows that around 85% of diners use them if they are offered. 9. Donate your still-consumable food to organisations such as FareShare, Foodbank, OzHarvest and SecondBite, who redistribute it to charities that feed hungry people. 10. There’s an app for that! If you are in Melbourne you can sell excess still-consumable food at discounted prices on the YUME app, or donate it to charities as well. The Olio app also allows for sharing of surplus food too. Alsco tip – consider using reusable wipes when cleaning your area. Unlike other wipes that eventually end up in landfills, reusable wipes are recyclable, efficient and environment-friendly. A great option to clean any surface. Consider implementing these tips and make a difference in helping Australia reduce food waste while improving efficiency and customer satisfaction. You too, can help reduce food waste, participate in their research. Act now! Alsco would like to thank Dianne McGrath of Watch My Waste for sharing this article. Watch My Waste aims to help reduce food waste in the food service sector.